Free quick-start guide for women who want to shake things up and become the authentic, purposeful, radically alive women they could be, created by a seasoned professional who has shepherded hundreds of women through major challenges and on to fulfillment. Feel like you’re not making the most of your life? Tired of fear hijacking your dreams? Working hard but not getting where you want to go? Fighting indecision, procrastination, or any of the other knotty little issues that keep us from fulfilling our potential? Reclaim your power, develop your confidence, and learn to be decisive, tenacious, and strong. 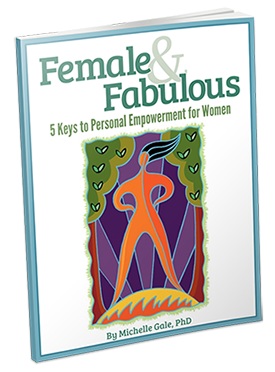 Take the first step with Female & Fabulous: 5 Keys to Personal Empowerment for Women — free. Just type in your email address below. Check here to receive Michelle's latest articles on personal empowerment and exclusive members-only content and special offers.